Bald Eagle, Haliaeetus Leucocephalus. We floated the Kenai River in Alaska, and came across this eagle which performed a full "neck rotation" as it watched us float by. Perched atop the tree this Bald Eagle was keeping vigil for its next feeding opportunity. 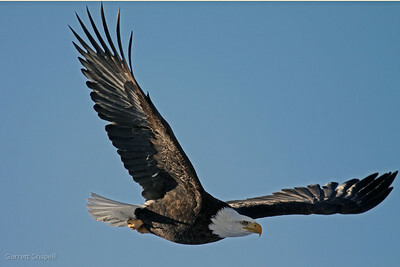 Bald Eagle, Haliaeetus Leucocephalus. A bird rescue fundraiser provided this up close and personal shot; an amazing amount of tolerance was displayed by this majestic specimen. Sand Hill Cranes, Grus Canadensis. 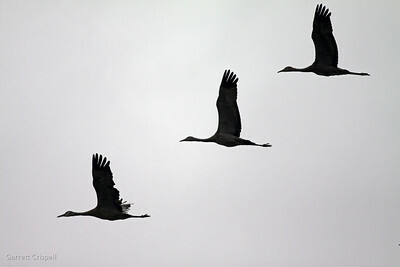 Sand Hill Crane migration. Creamers Field in Fairbanks offers a respite for many species of birds during their Spring and Fall migration. Sand Hill Cranes can congregate by the hundreds, if not, thousands, making for some pretty nice photo ops , amidst the noise. Mute Swan, Cygnus olor. 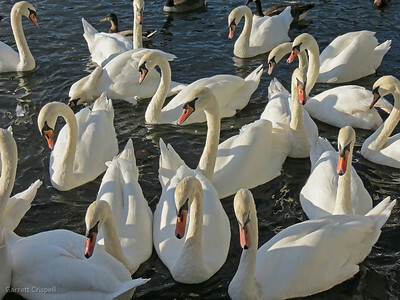 Many people consider swans to be rather elegant. This gaggle was taking in the late afternoon sun. Bald eagle, Haliaeetus leucocephalus. On my way to a mid-morning business meeting on a beautiful sunny Spring day, these two were camped out on a 20 -25 foot snow berm for several minutes. 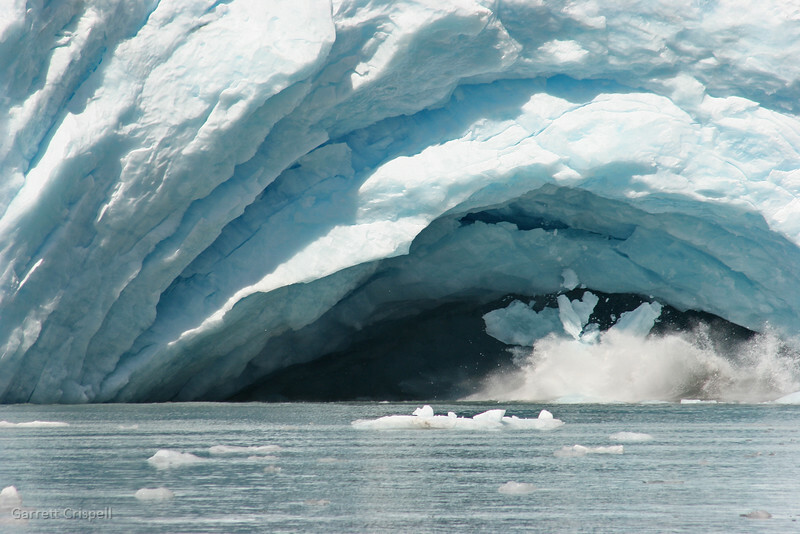 I shot for several minutes with a 75-300mm lens and then switched to the 400. Take-off occurred rather quickly, making shooting with the 400mm lens a bit of a "close" challenge. 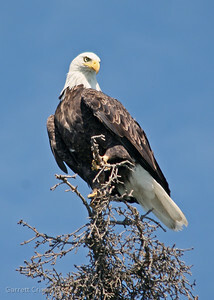 Bald Eagle, Haliaeetus leucocephalus. 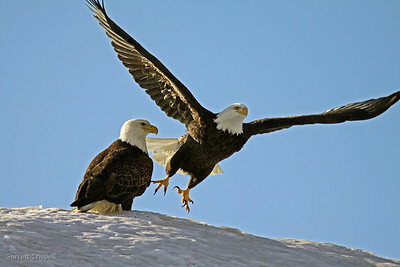 Just two wing flaps into its take-off and this Bald Eagle is making impressive progress. 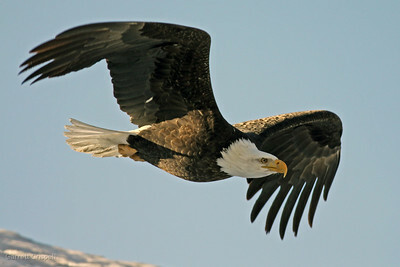 Bald Eagle, Haliaeetus leucocephalus. Just a couple "wing flaps" and this Bald Eagle was in "cruise control." 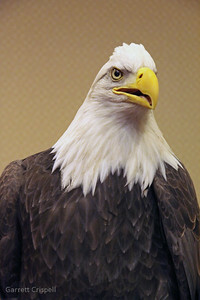 Bald Eagle, Haliaeetus leucocephalus. Two "wing cycles" and this Bald Eagle is air borne and gaining speed. Efficiency of movement is a pleasure to watch. No doubt the 25 foot snow berm assisted in the endeavor. Snowy Owl, Nyctea scandiaca. 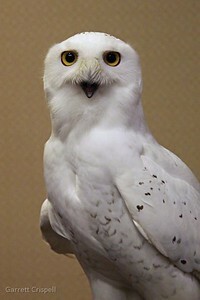 This Snowy Owl was one of many birds available for up close and personal viewing at a local bird rescue fundraiser. 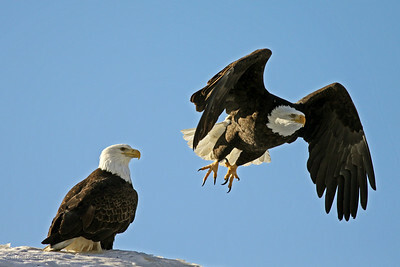 Just two wing flaps into its take-off and this Bald Eagle is making impressive progress.